Most of iguana care can be common sense stuff and not hard to figure out if you take time to think about where iguanas come from and find out that they are primarily plant eaters. Coming from Central and South American tropical jungle areas, they live with all year round warm and humid climates, with lots of sunshine and trees for shade also, where temperatures are vary from the 80's to 90's(F) degree range day and night. The hard sad fact that continues to go on with captive raised iguanas is that there�s an endless pattern of people raising baby or young iguanas and failing to provide one or more of the simple requirements and these iguanas are doomed to suffer serious bone deformities within several months. 1) HEAT and WARMTH: For brief periods during the day, the iguana needs a rather hot basking spot or area that provides 88 TO 95(F) degrees but there also has to be a way for the iguana to escape that heat and rest in an area for day and night that's about 75 to 80 (F) degrees. As the iguana gets into temperatures lower than 70 (F) degrees, the iguana's body shuts down resulting in less ability to function, less appetite, less immune system activity, etc. Iguanas can certainly survive even long periods in temperature well below 70 and even 60 (F) degrees but they are just lingering along and not able to function. 2) FOOD and WATER (The base or bulk of the diet has to be true CALCIUM RICH LEAFY PLANTS/VEGETABLES such as collard greens, mustard greens, turnip greens, dandelion greens (instead of any kind of lettuce which tends to be much to void of necessary calcium). For VARIETY that helps for balance and water rich supplementation to the base of calcium rich greens of the diet, alternate with other items such as unsalted green beans, shreded squash, mango, canteloupe, strawberry, grapes, water soaked multi-grain bread. 3) SUNSHINE/SUNNING: To generate VITAMIN D which is so very necessary for strong bones, the iguana needs some brief, safely arranged and supervised sunning sessions (to avoid over heating or escape or harm from other creatures) to safely bask (not bake) in direct (without glass) sunshine that totals one to three hours per week during summer or otherwise sunny months OR a real, correct model and working UVB light that�s replaced every 8 months or so and used properly, close enough to the iguana to have any effect. Let�s start with an example of the most commom food failure. Iguana owners feed lettuce or Romaine lettuce as the main part of the diet, thinking it�s the right leafy green for the iguana to survive on, BUT IT�S NOT!!! The lettuce or even Romaine and other variations of lettuce are very poor in calcium and leave iguanas starved of calcium. The iguana must get water, if not from drinking out of a bowl, it will have to be from water soaked food. A SAFE and effective way for the iguana to get really warm (85 to 95F), but also needing a way to ESCAPE from being too hot, to cool down, to rest (70 to 79F). A SAFE way for the iguana to get a few minutes of exposure to DIRECT SUN light, (the natural and most effective way) OR many hours of exposure to an artificial "UVB" florescent light tube (which must be replaced every 8 months) so the iguana gets VITAMIN D, VITAMIN D, VITAMIN DDD, which is so vital and important and necessary for the BONES, for the BONES, for the BONES. 5) Besides air and space, that's all the iguana needs. A) THE BASICS OF IGUANA CARE ARE TRULY SIMPLE and FUN, SO BE HAPPY ABOUT THAT. B) IT'S NOT AS COMPLICATED AS SOME PEOPLE MAKE IT OUT TO BE. C) BUT, BUT, BUT, SOME PET OWNERS ARE UNAWARE OF CERTAIN THINGS THE IGUANA REALLY NEEDS AND THINGS THAT MUST BE CHANGED. There are a few important things to provide the iguana in order to promote good health. These are reasonably simple things yet each are vital and must be provided, not missed and not forgotten. Failure to provide ALL of these simple few but important things will create various health problems and doom for the iguana. Iguana eats calcium rich plants, gets nourishment and calcium. Also gets water from plants, fruit and ponds. Water gives life to kidneys. Iguana basks in the direct sunshine, gets extra warm and gets VITAMIN D.
Iguana gets warm in the 80 degree climate. Gets warmer by basking in the sunshine. His temperature rises up to the high 90's. All body functions operate. Iguana has shade of trees to escape the excessive heat of the sun. Iguana has night time to cool down in the 70's. The thick green plants provide most all of the calcium and other nutrients, such as other minerals, fiber, protein, etc., that he needs, including much of the water too. The water is ultra important for the health of the kidneys. The sunshine generates vitamin D in his skin. The vitamin D from the short periods in the sunlight plus the calcium from the plants assures his bones will be strong. The night time lower temperatures are what he likes for him to rest and sleep. It's a place that stays rather warm all year round, the temperature range varies from low 70's degree range at night, with daily temperatures ranging from 80 degree range up to 90's during the days. It's tropical with lots of shade, nothing like a burning hot desert. The iguana is outside where there's plenty of trees, plants, water and sun light. 1) The iguana is nicely warmed up during the day by the 80 degree temperature (in the shade) and gets even much warmer when basking in the direct sunshine. 3) The iguana eats the rich colored plants, which are commonly high in calcium, calcium, calcium, with a full array of other important minerals, (including oxalates by the way), vitamins and all round nourishment. There is lots of juicy liquid and water in the plants and fruit iguanas feed on. 4) At night, at night, at night, the temperature may be as high as 80 degrees during summer time, but it goes down to 70 degrees during other times of the year and even down to the low 60's during winter time. 1) When the temperature is 80 degrees, even in the shade, the iguana is able to attain a warm enough temperature for his body to function well. During the day, he is also going to seek out the direct sun light. Iguanas love the bright light of sunshine. The bright warm light is their greatest pleasure in life. Even if they have only one little spot to sit in, the bright sun light makes them really happy. 2) As they bask in the direct sun light, their body is generating one of the most important ingredients they need for their bones to remain strong. We call this vitamin D, the sunshine vitamin. The following section is arranged to emphasize what I isolate as the three main aspects necessary to focus on. 1) Focus or goal should be on what works to maintain STRONG/STRAIGHT BONES. Weak, bending, breaking bones is the number one biggest and most common health problem for pet iguanas, yet is it so simple and easy to avoid, to never have the problem. And if you do encounter this problem, it's easy to repair in most cases by providing these simple things. b) The SUNSHINE vitamin: vitamin *D*, obtained by safe EXPOSURE of merely brief periods in *direct* and early day SUN LIGHT, SUN LIGHT, SUN LIGHT, that is, direct, direct, direct, NOT through glass, NOT through glass, NOT through glass. Kidney failure is the number two most common health problem resulting in death for pet iguanas. b) Eats LOW, LOW, LOW amount of protein. The bones must have certain nutrients to develop as big strong bones or they are going to undevelop into weak bending bones that cripple and kill the iguana in a short period of time. Building big strong bones or rebuilding previously weak failing bones is simply a matter of giving the iguana two things, which are number 1)The sunshine vitamin, natural D, that the iguana gets from a few minutes of basking in early day unfiltered sunshine OR from many long hours, every day, of basking very close to an artificial Ultra Violet UVB producing florescent light such as the ZOOMED 5.0 model. And then there's number 2) Calcium rich food (collard greens). The iguana has a serious need for SUN LIGHT, not be taken lightly. --- SUN LIGHT is really important! SUN LIGHT IS FREE!!! REAL SUN LIGHT (direct, not through glass, not, not, not through glass windows!!!) If it goes through glass it may provide heat but not the UV rays that benefit Mr or Ms Iguana. If the iguana is in a glass aquarium and the sun is beaming into the glass it can easily magnify the heat and kill the iguana. BE AWARE, not sorry. The Sun's job is a divine process of injecting great nutrients into the iguana's skin. NATURAL! Exposure to Sun rays is the "trick", the"magic", the best thing you can do for your iguana. Unfortunately, some people will read this and still proceed to set the iguana by a glass window, "in sun light", failing to notice or believe that the glass or plastic is blocking vital nutrients from the SUN. They may learn the hard way but the iguana will be the one to bend and break. If you want your iguana to have bones that do not crumble, bend, or swell and you want your iguana to live more than a year or two and be healthy, then you must GIVE HIM SOME REAL SUN LIGHT. I highly recommend real Sun light exposure, twice a week, for just a few minutes (20 to 60 minutes is quite sufficient), three or four days a week would be better, but you don't have to do it every day. If you live where there is no access, at all, to divine sun shine, you may be compelled to employ the use of "alternatives", The so called "full spectrum lights". But to rely on unnatural alternatives such as "full spectrum" light sources may be a fruitless effort. The popular and heavily hyped "Vita-Light" is definitely too weak to get the job done, (I hate the Vita-Light for all the iguanas it has proven to fail). The newer generation of full spectrum florescent lights (the ones that specify Vitamin D production in reptiles, "B" spectrum, and claiming intensities beyond the Duro brand "Vita-Lite", are so much better, but they are not going to be anywhere near the quality of real sun light). NOTICE: As long as the iguana gets regular sunning during a good part of the year (at least in the summer time for the cold and snow seasonal regions), it is usually good enough. The most critical time when iguanas really need sun light (for their bones) is in the first two years but especially in the first six months of their little life. NOTE: Due to individual genetic strengths and weaknesses, some iguanas can live and develop well without getting the Sun exposure, longer than others, it certainly varies with each iguana. In other words, some iguanas that don't get sun light will have serious bone problems within the first three months of growth, while other iguanas can grow and appear well without getting hardly any sun light, for the first three years of growth! There are always exceptions and variations. In some cases a mineral rich diet is helping to compensate for lack of sun light better on one iguana than another, however in most cases, as mentioned above, individual genetic strengths and weaknesses determine how soon an iguana with need all the right ingredients for his sensitive bone structure to develop. Most iguanas bone structure will run into serious problems in the second half of their first year if they don't get the Sun's nutrients. -- BE CAREFUL -- DON'T OVERHEAT the guy! Iguanas can not take much heat! If it's a 90+ degree day, the iguana overheats dangerously fast!!! Sun light is usually to be found outside the home on a patio or in the yard. If your iguana is at risk of running away or vulnerable to other dangers, then put him in whatever works to contain him and allows for the sun bathing. You can use a small bird cage or hamster cage, whatever works. Any small, cheap, homemade cage will do as long as he cannot push his head through the bars or wire holes. It does not have to be a home away from home, it is only for a few minutes of sun bathing and therefore it can be an empty cage for simple sunning purposes. On a hot day (above 85 degrees), 10 minutes is plenty of sunning and may require spraying the iguana with water to cool him. As long as the iguana is comfortable and not overheating (breathing with mouth open to the heavens), you can continue for a full sun treatment of one hour, sun power. Be aware that hot sun light can quickly overheat and kill him. BE CAREFUL!!! The heat builds up in the iguana. He gets hotter and hotter while basking under the sun or even a light bulb. BE CAREFULLLLLLLLLLLLLLLLLLLLLL, not sorry. If the iguana gets too hot, he will start breathing through his mouth, with mouth wide open and gasping. Take him out of the heat and let him rest. Always have some reliable safety shade for him to escape, (in case you forget about him, even though you "supervise" the sunning). A board or towel covering part of the cage may do the job. REALIZE: If the sun light shines into your home, you can use the opportunity as long as the sun is not going through glass. The sun shining through a screen door or screen window is the prize. The iguana can bask in the sun light whether on the floor beside a sliding screen door or even on the open window's screen. The choice of using a sunning cage depends on the situation, as to whether the iguana could get lost, hurt, poop where you don't want him to, or create some sort of problem. When I first started with iguanas I could not imagine any thought or value of direct sun light exposure. I saw sun light come in through the windows and shine on to the baby iguanas in an aquarium. What else was there to know? I soon found strange problems occurring in some of my new baby iguanas. Arms bending, collapsing or breaking, swelling elbow joints and soft jaw bones appeared. The worst and usually fatal (depending on how much it has bent) is the bending BACKBONE. I went to a veterinarian that was familiar with iguanas and he explained about the serious need for iguanas to get sun light which NATURALLY produces vitamin D in their body. I was a little stubborn at first to accept how necessary sun light can be. I never thought sun light did anything besides creating warmth and providing light to see. I was ignorant about it's VALUABLE nutrient benefits. I explained to the veterinarian that sun light always came in through the glass windows and that it was a problem to get the iguanas out in the open because they wanted to run or hide. He told me that iguanas in the wild put themselves in the sun every day and it is not the iguana's fault once they are kept as pets. It becomes the pet owner's responsibility to get that lizard some real (not through the glass) sun light and he was right! He informed me that once the sun light goes through a glass window it has lost the positive effect because the glass filters out the important "ultra violet" illumination. I purchased several "Vitalite" florescent tube-bulbs and gave them an honest test. General Electric makes the same thing called "chromalux 75". Through direct experience I found that the florescent type full spectrum lights (most commonly used) are a very poor excuse for sun light. Apparently and I am convinced, these lights do not approach the intensity of the SUN, no way, not at all. People get the idea that a "Vitalite" is the answer to the Sun and then completely rely on it for the iguana. My humble opinion: It is only a temporary and desperate alternative when sun light is impossible to get. You will never need to use these artificial lights if you can manage to get the iguana some direct (not through glass or plastic!) sun light just twice a week for 20 to 40 or more minutes each time. Make sure the iguana is not stuck in excessive heat. BE Careful!!!!!!!! During the following years I saw iguanas at pet shops or iguanas that people were raising and so many of them were in various stages of bone deformity. All of the iguana's bones, especially the jaws, legs, back bone and even tail bones get soft and just start bending or breaking which causes paralyzing effects and other serious problems. Weak bones and Sun light deficiency will also make it real hard, if not impossible, for the female to deliver eggs (eggs develop in the female iguana, even without mating with a male). When you have seen this kind of damage in iguanas it can make you realize how awful and pathetic the problem is, and how important it is to prevent. I raised many iguanas using the artificial full spectrum lights, such as the VITALITE, the one so highly recommended by veterinarians, zoos and other experts. If you were to ask the veterinarian or zoo keeper which is clearly better they would have to say the sun. Personal experience would dictate using the Sun for iguana health, and realizing the ineffectiveness of sun light "replacements". I experimented with "VITALITES" ("full spectrum"), with several groups of baby and young iguanas. Some would appear okay for a while but other iguanas under the same conditions which included good calcium rich diets would still develop bone problems. I would say about 2 or 3 iguanas out of 10 would end up with some visible bone failure, but I found that some iguanas could also have very poorly developed and weak bones that do not show up unless viewed with x-rays. I found that raising baby iguanas with occasional (two times a week, 30 minute treatments) sunning, guaranteed perfect bone development (provided the diet is decent). I also found that putting the iguanas that have broken or swelling bone conditions, in the sun light every day for several (7 to 12) consecutive days would prove to get the bones to a rapid recovery in most cases. I became convinced that the direct sun light is so potent in it's effect on iguanas that even with a poor and low calcium diet, the bones still have a chance. I also consider there to be a connection in the iguanas that end up with large mineral stones in their body which might prove to result from dumping excessive calcium supplements into iguanas that are deprived of sun light. I believe that calcium cannot be utilized properly without the chemical/vitamin reactions generated when the sun rays energize the iguana's body. Veterinarians will mention "vitamin D" production but there can be other benefits from the sun light that are still unknown. Trust your local sun. Provide OCCASIONAL SUNNING, at least twice a week for an half an hour or more if you like. Let your iguana grow pretty and happy with SAFE (not too much heat) sunning!!! The way of guaranteed health and joy for iguanas is basking in the sun light. You may choose to use vitamin D supplements or injections especially if sun light is unavailable, but this is not the natural way to guarantee health without possible side effects. Three months of cold or rainy weather preventing sunning is not a problem if you SUN the iguana during the regular sun shine months of the year. Some people are using the "GRO LUX" bulb which is for plants and do not realize that this is a completely different light spectrum specific to a narrow light wave only for plants. There are other more extreme ultra violet lights and unfiltered black lights, but these may have possible harmful effects. If you can, stick with the original, THE ALL MIGHTY SUN. Remember: When sun light goes through glass of a window or aquarium, it is neutralized. The vital UV nutrients will be lost, you have warmth but no help for the bones! 1. The iguana MUST GET occasional SUN RAYS, direct, NOT through glass! 2. SUN LIGHT is a multi beneficial TREATMENT for iguanas. 3. Sun light keeps their bones STRONG and magically ENERGIZES them. 4. Do not RELY on artificial lights to replace REAL SUN LIGHTS. Sun light will make the calcium from foods effective. 6. 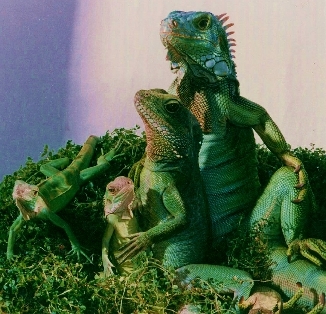 In their natural habitat of South America, iguanas LOVE to bask in the sun. 7. Make sure the iguana CAN ESCAPE THE HEAT OF THE SUN to cool down. 1. Just twice a week for half an hour should be enough to maintain any healthy iguana. Even 15 minutes! in the sun can be a health treatment for your iguana. The amount needed varies with each iguana, due to differences in genetics and diet, some iguanas will be able to go longer without Sun light than other iguanas. The more the better but you don't have to become obsessed and create an inconvenience by sunning every single day. A healthy iguana can easily go with out sunning through a winter or rainy season. Baby and young iguanas REALLY need the sunning most when you first get them. SUN RAYS GO THROUGH CLOUDS, so even a cloudy day can still be useful. 2. It is fine if you have a window that can be open out of the way to let the sun shine through a screen (not the glass). Make SURE the screen cannot be pushed or torn out of the way by a determined iguana, THIS CAN AND DOES HAPPEN. 3. With an iguana that can get lost or run away, use a SUNNING CAGE. A bird cage or rodent cage is great for sitting the iguana out on a patio balcony or in the yard. Just make sure to have a top cover on part of the cage to provide "ESCAPE SHADE" from excessive heat. Be careful. Don't cook the iguana! A box or small hut in the sunning cage may also get too hot so be sure the shade you provide is effective and safe. If the iguana sitting with his mouth up and open, that means he is overheated and must be taken out of the heat. 4. The size and location of a sunning cage can make him uncomfortable and scared. A large cage may scare him more than a small cage or vice versa. If the cage is very close to the ground, that may also scare him. You may want to try different sizes or locations if you see the iguana getting too scared or ramming the sides of a cage.